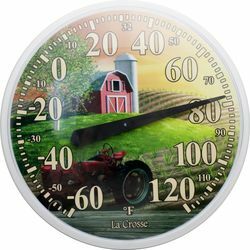 This Farm Thermometer is perfect for just about any location. Its built in camera is positioned so that this ordinary looking object can be placed outside any room which makes it perfect for a nanny cam or extra home security. Not only does this device contain a 1280 x 960 resolution camera, it also has a massive 90hr battery. High resolution video. Supports full color VGA quality video and full motion detection and up 64GB* Micro SD Cards, allowing you to store over an entire day's worth of video.